But it was there, under the huge trees that lined Walnut Street, somewhere near the University of Pennsylvania and the Woodland Walk, that I discovered my true connection to the outside world: bagels. On one side of the road was this guy with wiry hair, wearing some kind of tie dyed arrangement across his immense belly and with coke bottle glasses perched on his broad nose. And from his car sporting New York plates spilled more bagels than I had ever seen in my life. Not fancy bagels. Not big bagels. But chewy, dense, lightly crusty bagels and oh! So good! For a kid whose only contact with bagels was the deli/restaurant up near where Joe Frazier and the posh people lived, this was a revelation. I dug into my pocket, took out my five dollar bill, and nested it into his fat paw. I was rewarded with a broad fleshy smile and a grocery bag full of bagels, and over the next several days I gorged on them the way only a schoolboy can. I had bagels with ham, bagels with jam, and toasted bagels when they became too stale to eat fresh. They were lovely. Fast forward to the present – more years than I’ll admit to having seen pass. The leading bagels are bread-like, puffy and not at all the way I remember them. They often come in plastic, which ruins their crust. Even in New York City they’re easily twice the size and made for looks, not taste. So what’s a boy to do? Make your own, I say! And, once you have the hang of it, it’s not all that hard to do, either. If you don’t have a woodfired oven, no problem! Get yourself a pizza stone or 6 quarry tiles to line a rack of your oven. And find some high gluten flour. You’re going to need it to make some of those old time New York Bagels. Just the way they used to make them. Make the dough: Put the saffron and 2 or 3 ounces of boiling water into a ramekin or small bowl and let steep for 5 minutes. Put the flour, salt and yeast together in a large bread bowl and mix with the handle of a wooden spoon. Strain the saffron water into a 2-cup measure and add room-temperature water to measure 1 5/8 cups. Pour the water into the dry ingredients and mix well to incorporate, scraping the sides of the bowl as necessary to make a stiff dough. Knead the dough in the bowl for a minute and then put it onto a sprinkle of flour on the counter, cover with the bowl and let rest for 20-30 minutes. After the rest period, knead vigorously for 5 minutes to develop and stretch the gluten. Put it into the unoiled bowl, cover and let rise in a 60º environment for 3 ½ to 4 hours. Stretch the dough: Once the dough has plumped up to nearly twice its former size, move it to a work counter and press as much air out of it as you can by creating an elongated dough cigar. Curl the edge of it in on itself along the length to create a length of dough with smooth skin. Shape the bagels: With a serrated knife, cut the dough snake into 2 equal lengths. On an unfloured counter, roll each piece with your palms until it is 3 feet long, and cut in half again. Now cut each of the 4 pieces into three, giving you 12 pieces of dough about 6 inches long, most of which have 2 freshly cut ends. 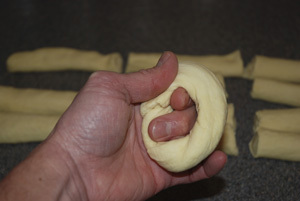 Take a piece in both hands and stick the cut ends together with your thumbs and bent forefingers, wrapping the dough around your other fingers to keep the hole open. Pinch together as best you can (no worries here, the bond will hold if you don’t pull it back apart) and set each back onto the counter. Once you have shaped all 12 bagels, go back to the first and, holding the cut ends together with one hand, stretch the rest of the bagel with the other into a bracelet of dough. 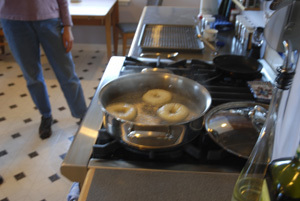 Final rise: Put the bagels onto parchment-lined pans, stretching them out one last time if the hole threatens to close. Let rise at room temperature for 45 minutes, covered with a cloth. 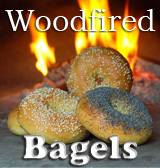 Heat the woodfired oven: Your fire should be 2 hours old, with enough heat to sustain for an hour’s baking, but not so much heat that it will scorch the bagels. Keep the fire to either the left or right of center, in order to heat the oven deck. Every 20 minutes for the last hour or so, move your fire side to side to evenly heat the floor tiles. A half hour before the bagels are ready, put two thin sticks of dry wood on and 2 wrist-thick pieces and bring to a flame. A few minutes before putting in the bagels, push the mature coals to the back center of the oven, near the wall, and brush the ashes off of the floor. There should be 6 to 8 fist-sized chunks of glowing hardwood coal and a good bed of embers, but no flame when the bagels go in. Heat the conventional oven: Heat quarry tiles or a pizza stone on the center rack of your oven at 400º for at least 30 minutes. For more on this, see ‘Baking bread on quarry tiles’. Make an assembly line: Boil 3 quarts of water. Have a 12-14 inch sauté or frying pan ready on the stove. Put a rack to one side with a pan under it to catch the excess egg and seeds. Mix the egg and water until frothy in a ramekin and have a brush handy. When the bagels have risen for 45 minutes, put the water into the sauté pan and keep at a boil. 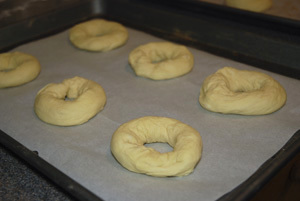 After they have cooled for a few minutes brush the boiled bagels with egg wash two times to ensure a good coating. 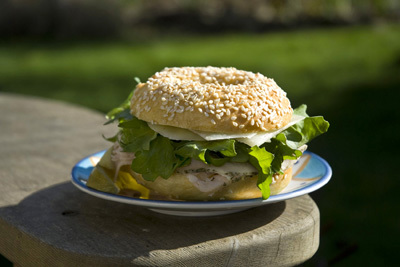 Sprinkle 1/2 teaspoon of sesame seed or poppy seed onto each bagel. Brush some with egg and leave unseeded for plain bagels. Carefully move the bagels back to the parchment before baking. 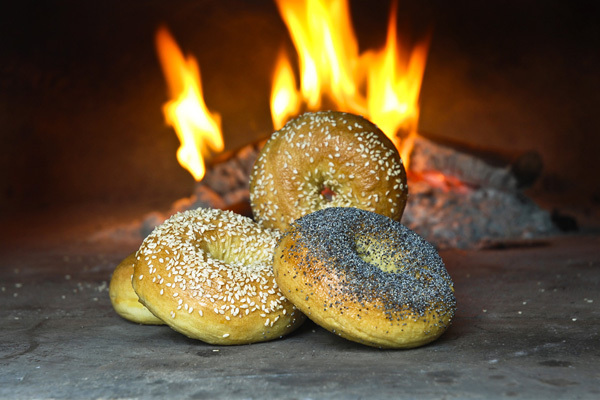 Bake the bagels in a woodfired oven: Slide the bagels on their parchment mats to within 8” of the coals. Close the door completely. Bake for 8 minutes, or until lightly browned where the face is to the fire. Carefully turn the parchment, using a peel and a gloved hand, and bake for a further 7 or 8 minutes, again with the door closed. This time will vary with oven temperature and fire strength. When they are brown and lovely, remove the bagels from the oven, place them on a rack and allow them to cool for half an hour. Bake in a conventional oven: Bake the bagels (six at a time) on the parchment paper directly on the quarry tiles for 10 minutes at 375º, turn carefully around and bake for a further 10 minutes, until the bagels are brown and lovely. In the last couple of minutes, you may want to raise the heat a little and turn on the convection fan to improve color. Let cool for half an hour, and then devour! Final notes: After making bagels three times in the past week, I almost left the woodfired aspect of this out. They came out beautifully every time, but it’s tricky anticipating the fire, the boiling bath, the shaping and the rising time of the bagels all once. I recommend that anyone who has a woodfired oven try making the bagels at least once in a conventional oven in order to get the hang of the process. I’d like to thank my son for convincing me to make larger bagels; my friends Posy, Josh and Hannah for their help and feedback; and that entrepreneurial hippy from New York for setting me on the right track. Flame on! Fantastic photo in front of the oven! I am inspired to build my own. WOW… I’ve never heard of anyone making their own bagels. You never cease to impress me. Is it customary to use saffron? I visited Turkey this summer and totally regret not bringing some of this back. It was so cheap at the spice bazaar! Thank you. These are gorgeous. I am making your pretzels first. They have been on my front back burner. I like the anticipation of a good bagel. Poppy, blueberry and everything. Butter, a smidgen of salt, and then another with a heavy dose of cream cheese. Nice. I’ve made my own, and was pleasantly surprised at how easy they were to make and how great they taste. I’m a hero when I bring them into work.. I gotta admit, yours look a lot better than mine! The pic in front of the fire is pure art. Very very cool. I will have to try it. I think this would be a fun one to do with my older daughter too! Beautiful bagels! 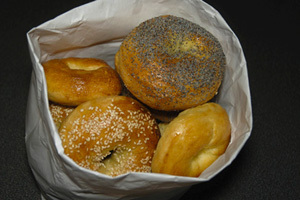 Now I’m craving New York bagels! I’d love to try making these at home. Yours look great. I tried twice and my bagel did not come out that great. I have to try this recipe. Wow, they look awesome, having a wood fire oven is every cook’s dream. I’m so jealous right now. (in a good way of course). Don, your pretzel and bagel recipes are awesome. I love both, but have never considered making my own. As as little aside, I spent the past two months with my grandma in the “old country”, where I watched her prepare various traditional baked goodies. All this was done in a wood fired oven. Not the kind that’s used for making pizza in pizzerias, but a stove/oven combo which is heated from the same combustion chamber. I found it quite funny that so many baking recipes specify the exact temperature and the exact time stuff has to be baked for, things she doesn’t quite bother with. Yet the result of her baking is absolutely amazing – she makes awesome (among other things) buchty and bacon biscuits. Your comments are very well appreciated and really are not ‘asides’ in my book; in fact they speak to the heart of the matter when it comes to the real issue, which is woodfired cooking. We’ve stayed a few times in an apartment block near the Campo dei Fiore in Rome that still has embedded in its kitchen a woodfired stove/oven combo such as the one your grandma uses, albeit nonfunctioning. I’ve made many meals on the newer gas stove/oven standing to one side and have imagined cooking the way you describe. When you have the knowledge, as your grandmother does, you have everything. To me, it’s a shame at some level that all of our ‘labor-saving’ or ‘time-saving’ conveniences have put us out of touch with the things our ancestors found so important. Thanks for your comments and your great recipes, especially the Buchty recipe, which I find describes my wife rather well (although, come to think of it, she’s full of beans, not plum jam and she’s smaller not larger than average!). And thanks, too, for putting me in touch with your site. Maybe next time you head to the Slovak region, you can take me along? Fantastic picture! Your bagels look and sound delicious right now. Lovely bagels! I’ve been searching for a great bagel recipe, now I think I’ve found one And a lovely story too. Great looking bagels. I made my first bagels yesterday and thought they came out great. I didn’t do as good a job forming them as you did, but will get better with practice. Fantastic! What a great blog post too! I used to make bread and pretzels, but I’ve never tried bagels. This is soooo awesome! excellent photo. I’ve always wanted to try to make bagels so I will have to make this one day. thank you for sharing! Wahoooo! How awesome are you?!?! Foodbuzz number 1! That’s so exciting. These bagels are beautiful. I am definitely going to try these out! What great, descriptive language in your post. An inspiring piece to read. Well done! This is great, I love bagels. Beautiful photographs. Really. Good job. What lovely bagels!! They look so good. Enjoyed your story very much. You are so right –so many of the bagels sold are are “soft and puffy”. Gone is that crunch on the outside of the bagels that identifies a genuine bagel. I am not a good bread baker at all but one day I may give this a try! Thanks!! I never thought of making bagels in a woodfired oven. They look amazing. wood oven ….. the best. How far are you from NYC? maria ! Don, This is the first time I’ve seen a good recipe for bagels on a small scale. Thanks. Thanks for all your great comments, feedback and support. You’re all wonderful. The saffron adds a very small amount of flavor, but is mostly for color. I don’t really want to add egg, the other addition that would give the right color. White bagels just don’t seem right to me. And for the record, I live thousands of miles away from NYC in Seattle. Look me up when you’re in the neighborhood! As a dyed-in-the-wool New Yorker in Minnesota, the lack of bagels on a Sunday morning can be cause for despair. I have been thinking of making my own…. how timely. Love the saffron in the water! 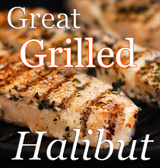 Stunning pictures and a great recipe. Homemade bagels are the best, I’ve bookmarked this. Your bagels look great! I made bagels once a long time ago and have been meaning to try again. Your post is an inspiration to try them soon! Thanks. I want to make some bagels again! I noticed in this recipe you only boil the bagels 30 seconds, the recipe I used last time said about a minute per side, could this have been why they deflated? I think that’s it. I tried several times over the years to make bagels and only recently did I figure out I was over-boiling them, too. The skins never developed. If you let the bagels proof overnight in the fridge, the way I did one time, you can boil them longer, but the finished bagel is not as good as the Flaming Good Bagel recipe. Beautiful oven! As a former Jersey girl, now a long-time Californian, let me suggest Nancy Silverton’s sourdough bagel recipe. Awesome! Really, the best ever according to my Brooklyn-born spouse and East Coast friends. BTW, have you and I communicated before? Your url seems familiar but the look of this site, lovely, by the way, is different. Cheers! I love the idea of making your own bagels and pretzels I love the Bagels with the onion and sesame and poppy seeds these are soooo good but if you buy them you only get 4 in a bag, it never last, so now I can make my own and have all I want yay!!! I’ve never made my own bagels before. That would be amazing.